It was a busy weekend for me in Second Life. Sunday, Wrath and I began looking up inspiration for a new very special build, one that would be the virtual home for the Teal Life Foundation in Second Life. Teal Life is a non-profit organization whose purpose is to educate women about ovarian cancer and assist those who have been diagnosed get the care and support they need. It was founded by Crystal Elliot after she, herself, was diagnosed. Crystal lost her battle in May of this year but her legacy, Teal Life, lives on to help others battle this cruel disease. 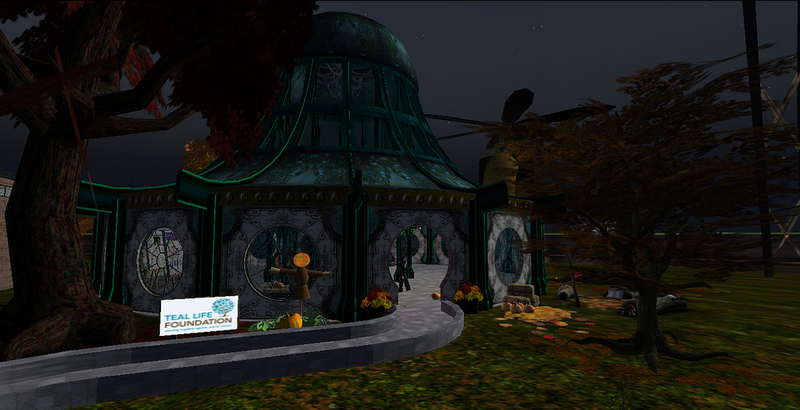 I’m very honored to be able to play a small part in bringing TLF into Second Life to educate more people about ovarian cancer as well as network with and support other organizations in the fight against cancer. Currently, the TFL headquarters is in Caledon Steam SkyCity (http://maps.secondlife.com/secondlife/Caledon%20Steam%20SkyCity/105/138/75). I liked the idea of “rising above” cancer as the entire build of SkyCity floats in the sky above open water below. Wrath took my suggestions of a Victorian orangerie and images of the Palmenhaus Schönbrunn and ran with it, creating an oriental steampunk inspired build with a tree atrium and windowed rooftop. Main color scheme? You guessed it–teal! We’ll probably be tinkering on it for a while but I adore the results–lots of etched metal, lots of ornamental girders, all focused on the teal tree in the center (Teal Life’s symbol). The main floor is primarily for education and outreach–so far there are a handful of interactive boards, leading to various websites (including Teal Life’s). The lower floor (in the “belly” of Steam SkyCity, so to speak) is to house a conference/presentation area and events area. This will be accessible via a teleporter just inside the front door. There is an in-world Teal Life Foundation group as well which is open for anyone to join. I’ll be adding updates as we get events planned and on the schedule. « USA’s VGDC (Video Game Development Club): Not a Club for Lurkers!